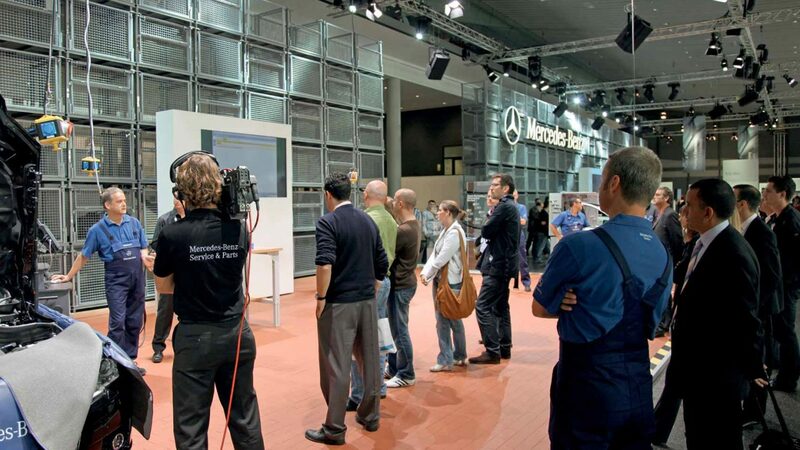 Highlight and eye-catcher at the Automechanika, the leading international trade show for the automotive aftermarket, was the hydraulic hoist ballet, an installation which Milla & Partner created for the Mercedes-Benz stand as an intrinsic part of its architecture and communication concept. 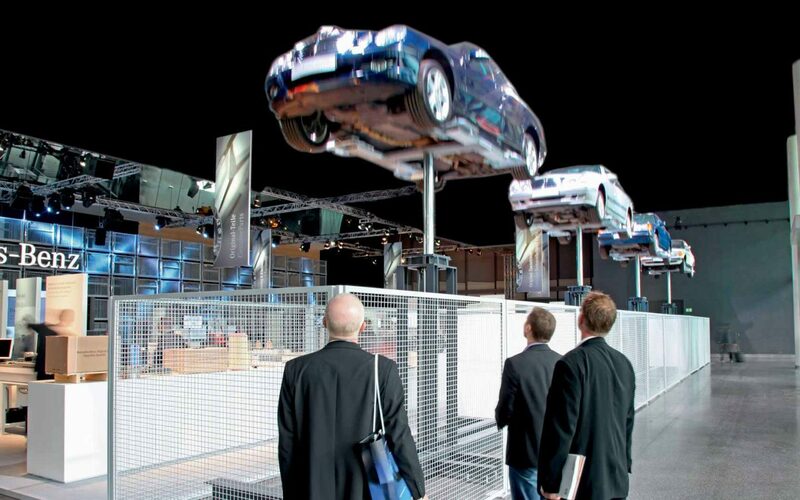 Visitors to the fair, as they approached the stand, could already experience the vehicles in motion along the raised platforms. While the ballet along the glass front of the stand clearly defined the brand space, all along the opposite wall, a series of pallet cages dominated the landscape – a 6-meter high and 40-meter wide horizontal surface created entirely from the standardised metal cages used for delivering auto parts worldwide. Authenticity and closeness to the world of workshops and service partners were the focal point of the concept’s content and design, and could be directly experienced throughout the entire hall. Milla & Partner was responsible for the overall communication concept – from the visitor orientation system, to graphic design and communications-oriented furnishings, all the way through to entertaining live shows. The annual Adam & Eva Awards were awarded in Mannheim last night in a festive gala event. As almost every year, Milla & Partner was among the winners, impressing the jury with their Hydraulic Hoist Ballet and Pallet Cage Horizon, two installations which Milla & Partner created for the Mercedes-Benz stand as an intrinsic part of its architecture and communication concept.